What drew you to cardiac surgery? The heart is a fascinating organ, essentially a pump with an electrical generator attached to it, and yet the surgeries we perform to augment or correct its function are incredibly complex. The results can be transformative. Treatment of heart failure is the ultimate instance of this. There is such satisfaction in taking a heart that is essentially not working, and by implanting a left ventricular assist device (LVAD) or performing a transplant, you can improve the quality of a patient’s life almost immediately. What other services does UVA offer for patients with heart failure? We offer the total artificial heart, which is unique in this area. In addition, we have the ability to go out in the community, place critically ill patients on ECMO and move them to UVA for further treatment. We are also at the cutting edge when it comes to introducing new treatments for patients with heart failure. For instance, we are part of the Momentum 3 trial for the newest generation of LVADs, the HeartMate 3™. You chose to do your fellowship at UVA. Why did you stay when asked to join the faculty? In both cases, it was the commitment to quality that drew me here. The people who trained me are excellent clinicians and surgeons—and also excellent teachers, a combination that I think you don’t always find. Surgery is a two-person endeavor. As a fellow, you want to train with surgeons who are passionate about teaching and training you. I consider it an honor that my mentors here asked me to join them because I learned so much from them. I look forward to following their example as I take part in training the next generation of surgeons. Why did you choose to specialize in vascular and endovascular surgery? My reasons have always been simple. I wanted to make a mark in society by helping those in need. Having always enjoyed science and anatomy, surgery just felt right. I like vascular surgery because patients have real tangible benefit and relief after their procedures. 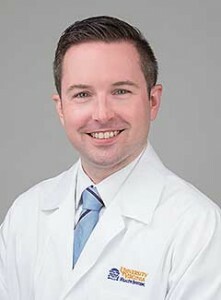 We, as vascular surgeons, are uniquely equipped with skills to handle arterial and venous diseases with both open and minimally invasive (endovascular) techniques. I’m attracted to the wide arsenal of tools and approaches to handling problems related to blood vessels. It’s exciting to be in a position to use technology that is rapidly expanding the options we have as surgeons. You did your fellowship at UVA. Why stay? I should say first that I was thrilled to be asked! One of the reasons I accepted is that at this academic medical center, I have the opportunity to provide state-of-the-art care to patients using some of the newest surgical devices and treatments. It’s exciting. These usually involve more minimally invasive procedures and better outcomes for a wider range of patients. I believe that the UVA Medical Center’s investment in innovation make it invaluable to the community it serves. Could you point to an innovative program that particularly benefits patients? Providing highly responsive care is not just a matter of technology. In the case of aortic emergencies, UVA looked at the way we deliver care and devised the Aortic Alert program. The goal is to optimize each step in the process. 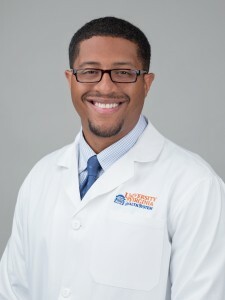 For instance, when referring physicians treating aortic emergencies call the UVA Transfer Center, operators immediately connect them to UVA’s attending cardiac or vascular surgeon serving as the aortic triage officer on call. While they are reviewing the patient’s condition, personnel from UVA’s Office of Telemedicine are patched into the call to facilitate the transfer of pertinent images to UVA radiologists. The net result is that when the patient arrives, we have the appropriate team on hand and the appropriate facilities ready. Are there other qualities of vascular and endovascular surgery at UVA that you think might be of interest to referring physicians? I think the Aortic Alert system highlights the emphasis we place on collaboration and communication, both within our team and with referring physicians. Many of the patients I see have other conditions that make their treatment complex. By developing formal processes that open lines of communication among disciplines, we create an opportunity to provide the best possible care for patients.